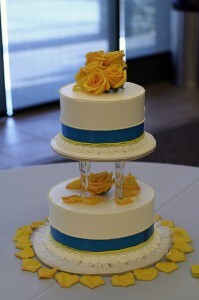 I love fresh color combinations and this blue and yellow is one of them. Blue and yellow is a combo that can go drastically wrong though. At times if the blue is too dark or the yellow is too gold it can come off a bit “sports fan”. Unless, you are specifically having those colors at your wedding because you are indeed the worlds biggest fan of whatever team you love..well then. True story, I once went to a wedding of a friend who was such a big Clemson fan that she had her wedding in purple and orange. We don’t have much here in South Carolina but we love our college football. Back to blue and yellow..particularly this blue and yellow. I love. The blue is just light enough and the yellow is bright and sunshiny. It makes me thing of Spring. I love the yellow roses too. I know they traditionally mean friendship..but who cares..they are so fun! What do you think? Do you love blue and yellow? Do you know someone who had a sports team themed wedding? Was it well done or over the top tacky?